"For 50 years I have been afraid to go to the dentist! Now that I see Dr Biank I can't wait to go!" After an extraction Socorro Vazquez remarked: "Where have you been all of my life? I did not feel a thing!" "Both my husband and I have been a patients of Dr. Vincent Biank's for many years and his work is impeccable. His staff is very friendly and accommodating in emergencies. He has very good office hours that fit into our schedule's quite nicely. 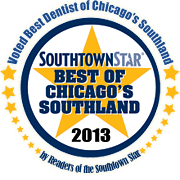 I highly recommend Dr. Biank to anyone looking for a dentist in the Southwest suburban area of Chicago. As a matter of fact, my husband I and will be moving to Indiana next year and we plan to keep Dr. Biank as our dentist." "Dr. Biank replaced all of my silver fillings with tooth-colored fillings and I have never been happier with my smile!" Dr. Biank has been available to people in the southwestern suburbs who are interested in improving their dental health for over 30 years. He sees people from 2-82 and loves to help people who have not been to the dentist for years due to fear. His chairside manner demonstrates his years of experience and his desire to treat everyone as a person.